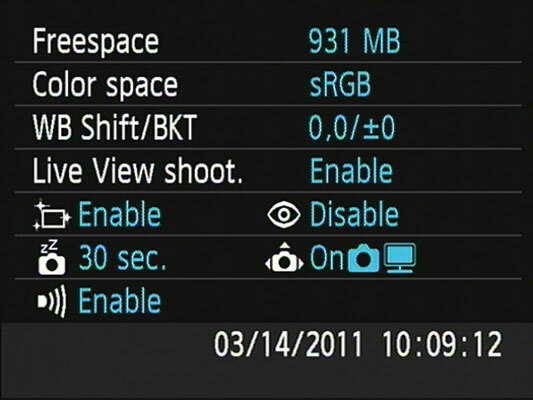 On your Canon Rebel T3 or T3i, you can view a collection of additional settings data via the Camera Settings display. This screen is purely an informational tool, however; you can’t actually adjust any of the reported settings from this screen. To display the Camera Settings screen on the T3i, first display the Shooting Settings display by pressing the shutter button halfway and releasing it or by pressing the Disp button. Then press the Info button. To display the Camera Settings screen on the T3, first display the menu system by pressing the Menu button. With the menu displayed, press the Disp button. The display shows the settings that you can monitor when shooting in the advanced exposure modes: P, Tv, Av, M, and A-DEP. Here are the details you can glean from the display, with settings listed in the order they appear on the screen. White Balance Shift/Bracketing: Add this to the list of advanced color options. Auto Sensor Cleaning and Red-Eye Reduction flash mode: These two functions share a line in the screen. On the T3, instead of Auto Sensor Cleaning, this option controls Auto Power Off. Auto Power Off and Auto Rotate: These two settings also live together on the display of the T3i. In exposure modes other than P, Tv, Av, M, and A-DEP, the Color Space and White Balance Shift/Bracketing information items don’t appear in the Camera Settings display, because those other modes prevent you from adjusting those two features. Of course, with the exception of the free card space value, you also can simply go to the menu that contains the option in question to check its status. The Camera Settings display just gives you a quick way to monitor some of the critical functions without hunting through menus.